A simple philosophy, a mantra of sorts. The key to finding one's bliss. Or not. Maybe it's just a simple tagline for a simple project that has grown out of mutual respect among writers. See, it's hard work, writing. And after a long day of staring at empty pages and erasure dust, the last thing a writer wants to discuss is their writing. Or in some cases, the lack thereof. And so...the Signature Sandwich began. My name's Ian. I meet writers (over 150 now) and I ask: What's your favorite sandwich? Kindly, they sign my leather journal and tell me all about it. Some writers give every detail, others simply one word. Others fill the page of my journal with stories of their youth or list a favorite restaurant. Detailed entries are made as stated. Vague responses allow for more creative freedom on my part. And for specific locations, well, I refill my MetroCard or pump up the tires on my bike and track it down. Whatever the approach...a sandwich is made or purchased and enjoyed. 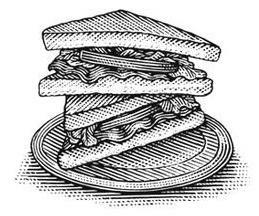 It all began as a joke of sorts, a conversation starter with writers, but What’s your favorite sandwich? led to a profound insight, a discovery that this was something much bigger. I found that each sandwich is as unique as the writer that eats it, that their sandwich choice is a new lens through which to view the writers we admire. More than just two slices of bread with something in between; it's a commentary on culture, background, status, experience and, of course, taste. We often forget in that moment of awe when finishing a book that there’s a person on the other side of those beautiful pages. The writers we love and respect are genius, but they too are flesh and blood, with grumbling stomachs like you and me. And so we cut the crust; talk about their books by talking about sandwiches. Thank you for visiting. Keep reading and keep eating.